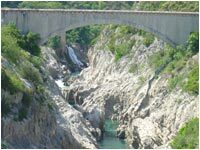 The Hérault Canyon 4 km away, the Canyon of the Buèges and the Vis. 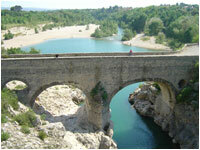 From Brissac to the Pont-du-Diable, the Hérault river goes through its most picturesque and richest natural heritage. 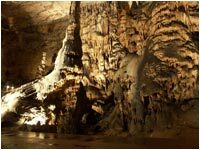 Underground beauties: you will find in our region lots of made-up grotto which bring you the magic of the underworld. The prettiest are the “grotte des Demoiselles” 5 km away and facing the farmhouse, “la grotte de Clamouse” near St-Guilhem-le-désert and “la grotte de la Dévèze”. The Pic saint Loup, the Séranne mountain, the National Parc of the Cévennes and the Aigoual (1 567 m) will make the joy of the those fond of mountains. 45 minutes from Brissac, the Aigoual will allow you to ski in the winter season. The cirque of Navacelles - 15 km: The river “La Vis” has notched through the limestone plateau of the Larzac and created this fantastic canyon, classified as a top natural site. At the end of the canyon, an oasis of freshness, the village of Navacelles sits in the middle of the cirque surrounded by enormous limestone cliffs. 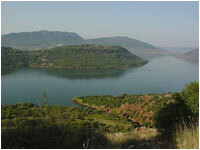 The lake of the Salagou - 30 km: This large lake with african colours sits in the volcano country. Windsurf, fishing and mountain biking are the main activities. The sea and it sandy beach are 50 minutes away.